The frontal boundary is crossing southern Iberia today, where Portugal radar showing some stronger storms forming along it, as well as seen on the visible satellite imagery. These storms could bring some heavy rain and strong winds. 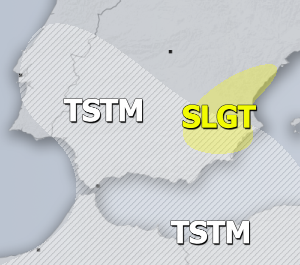 Area in included in the general area for TSTM risk area issued on DAY 1 outlook for 19/10/2013. Looking widely over western Europe, satellite image is showing a rather impressive area of numerous low-topped storms over the eastern Atlantic, as relatively cold mid-level temperatures overspreaded the still warm SST of Atlantic ocean, which resulted in storms to easily forming. 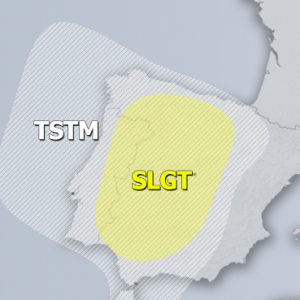 Threat for heavy rain and strong winds should continue through the day while spreading into western Europe towards and across the TSTM/SLGT risk areas issued on DAY 1 outlook for 19/10/2013. Follow the ongoing convective activity on France radar, UK radar, Ireland radar, Portugal radar, Spain radar and satellite pages.